Surfing factors to define score â&#x20AC;˘ The extreme side of surfing today is trying to catch the biggest wave possible. Sometimes surfers will use jetskis to pull them far out into the ocean to areas where there are giant and fast waves to catch. This sport is very dangerous as the waves can be powerful and close together. 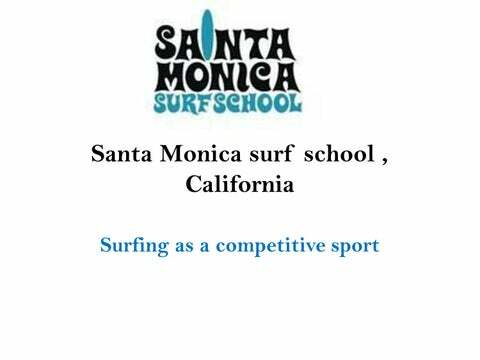 It is said that the largest wave ever surfed was 70 feet tall!Â Competitive surfing in California is a judged sport. Competitors will ride sets of waves and judges will determine who has the best score based on a number of factors including length of ride and tricks performed. Surfing Equipment includes : The surfboard, Wet suit, Surfboard wax. Common Surfing Terms Hang Ten: Riding a surfboard with both feet on the front of the board and all ten toes hanging off the edge. Tube Riding: When the surfer gets into the portion of the wave where the top of the wave has curled over the rider and the surfer is now riding inside a tube of water. Snap: When the surfer makes a quick turn right at the top of the wave. Floater: When the surfer rides at the top of the wave. Pump: When the surfer turns back and forth into the wave to generate speed. Cutback: When the surfer turns back into the breaking part of the wave. Regular: Riding the surfboard with the right foot on the back and the left foot on the front.